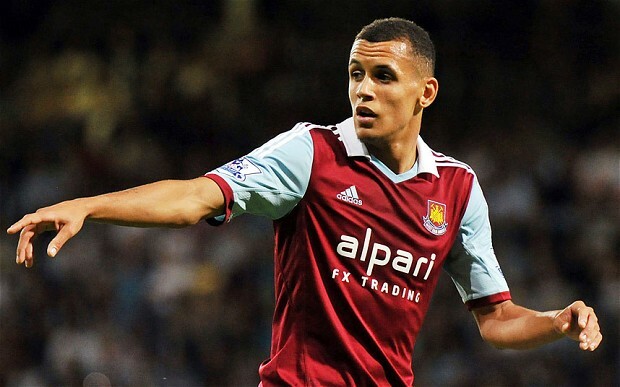 What next for Ravel Morrison? Sir Alex Ferguson described him as the “best kid he’s ever seen” and for the first 6 months of the 2013-14 season, it seemed that after a troubled past, Ravel Morrison was beginning to live up to his star billing. He was the dominant attacking threat at the heart of West Ham’s midfield, showing skill and composure beyond his years. The comparisons to Paul Gascoigne were obvious especially after his majestic, solo goal against Tottenham in the Premier League. Running from his own half, Morrison glided through the centre of the field leaving the Spurs defence in his wake before chipping the ball over Hugo Lloris to seal a 0-3 win for the Hammers. His ability with a football was never in question and his off-field problems were allegedly behind him. Unfortunately, Morrison’s talent went unfulfilled at United but he was offered a chance of redemption after he completed a move to West Ham in January 2012. It seemed Morrison had matured both as a player and as a person at West Ham under Sam Allardyce. Consistent exposure to first team football allowed him to showcase his abilities on the big stage and 3 goals and 2 assists in 12 Premier League games captured the attention of the wider football community. He had quickly become one of the hottest, young prospects in the league during the first half of the 2013-14 season. There was even talk of a potential England call-up should he maintain his form throughout the rest of the season for the Hammers. He’d already done well for the England u21 side and a goal he scored in training for the young lion’s oozed confidence and natural ability. However, Morrison’s good run of form in the West Ham first team was interrupted in ambiguous circumstances as he joined Queens Park Rangers on a 3-month, emergency loan deal in February 2014 which left Hammers fans scratching their heads. The full tale of Morrison’s exit is an unusually intricate story, shrouded in mystery but ultimately it has proved detrimental to his progress as a footballer. “Listening to our medical staff there is no problem that he can carry on – not at all. This was only the tip of the iceberg in a far more complicated situation where the groin injury may have posed as a cover story to hide underlying issues between the player and manager. After Morrison’s auspicious start to life at West Ham, it was reported that football agent, Mark Curtis had organised a meeting with him in late 2013 to determine whether the player would consider becoming one of his clients. Curtis already represented many West Ham players and more generally, players who currently play or have played under Sam Allardyce and this is where the situation becomes a shadowy affair. Morrison’s chequered past makes it easy to jump to conclusions; suggesting the player and his representatives were attempting to force a move away from the Hammers, with a £4 million pound move to Fulham the most obvious choice. However, the dubious past of Mark Curtis should also be brought into the equation. Curtis was given an official warning from the Football Association in 2008 for his part in Luton Town’s illegal transfer activity. This plunges the whole situation into what could be perceived as a black hole of shadow games and bully tactics in some sort of strange, football agent client cartel. The loan move to QPR allowed Morrison the opportunity to find his form again with 6 goals and 2 assists in 15 Championship appearances. However, the drop to the Championship essentially ended his chances of making the England squad for the World Cup. Morrison returned to West Ham this summer but his future with the Hammers remains in-doubt. As it transpired, the midfielder has had surgery in the close-season to repair hernia problems he had been suffering from, thus casting serious doubt over the statements Allardyce made in February 2014 criticizing Morrison for not playing through the injury but also shattering any image that the injury was a cover up. “I think he’s had a hernia op. Once that’s healed up I hope he becomes a better player because he has been playing with it for a while. The groins have been causing him a problem for a while. The conflicting elements of the story make it almost impossible to determine the truth of what actually happened. All the components just don’t add up and whilst the affair still continues, the burgeoning questions continue to grow; what next for Morrison? How can he move on from this prolonged and sorry episode? With the talent he possesses, it would be a great shame to watch him waste it all moving from one club and conflict to the next. However, he has not helped his own cause after he was very recently, charged with the assault of his ex-girlfriend and her mother in late July 2014, actions which are inexcusable for anyone, never mind a professional footballer and role model. It would be a great loss to football should he not realise his potential. Once Morrison has fully recovered from his groin operation and served his punishment for assault, it will be important for him to decide his immediate future, whether that’s at West Ham or elsewhere. Then he can concentrate on returning to form, playing the type of football we saw during the first half of the 2013-14 season, exciting fans with goals like that at White Hart Lane. Maybe one day he will lead England’s creative edge on the world stage as his early promise suggested and Sir Alex Ferguson envisaged.